You are currently browsing the tag archive for the ‘Elizabeth Market’ tag. 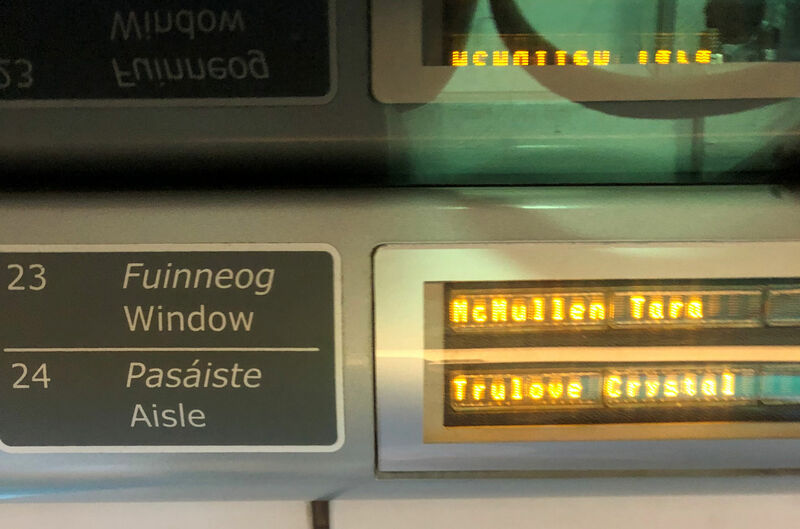 Our names at our seats on Irish Rail. We didn’t plan our time well and gave ourselves 3 minutes to eat the buffet breakfast we had each paid €13 ($15) for. Instead of eating, we collected food into take-home containers we had saved from the day before and ran out of the hotel with rollerbags and shoulder bags, and paper bags of breakfast and coats tied around our waists. It was only a couple blocks away, over a bridge, and into the station. I had already purchased the tickets, but needed to figure out how to get them, and of course I chose a machine that wasn’t working, but since I didn’t know what it was supposed to do, I stood there, poking buttons until the intercom said our train was boarding and my stress level ramped up. We ran to an information booth and no one was there, but when a man showed up, he directed us to use the kiosks we had just left. I was about to say I had already tried that, but I spotted a different kiosk and the screen was different, so we tried that, and realized the first one had been broken. With our tickets we ran toward the trains. At the entrance gate Tara’s ticket worked to open the bars, but mine didn’t. I stood there frustrated again, until a woman on the other side of me couldn’t get hers to work either, and asked the agent nearby if she could just walk through the path for people with disabilities. Without looking up he said “yeah,” and she ran through. So I did too. Then I saw that our platform was at the very very end, past another whole train, so we ran the length of the train. The whole time the intercom is announcing that the train for Cork is boarding, please get on the train. We finally get to our train, but we have “E” seats, and we’re at “A” car. So we run past A, then B, etc. Finally, finally get onto our car, drag all the luggage in, and collapse into our seats. Our seats displayed our names at them, which was cool. We were not cool, but hot, from having run so much. It was not a good start to the day. By noon when the train stopped, we had eaten, chatted, listened to the group of chattering ladies who got off the train at Mallow to go to a wedding, and finally relaxed. We were ready to take on a new city. 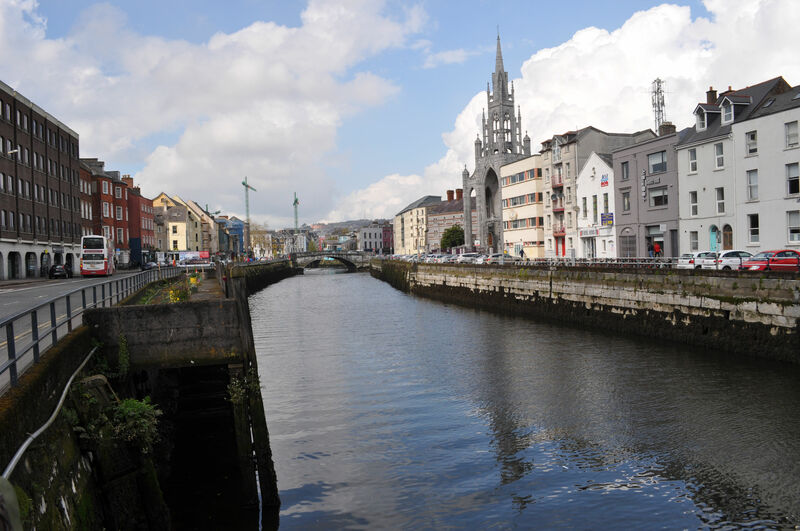 The River Lee flows through Cork. Holy Trinity Russian Orthodox Church is right on the riverbank. It was a short walk to our hotel, and we were too early to check in, so we ditched our bags behind the counter and took off walking West, along the River Lee. 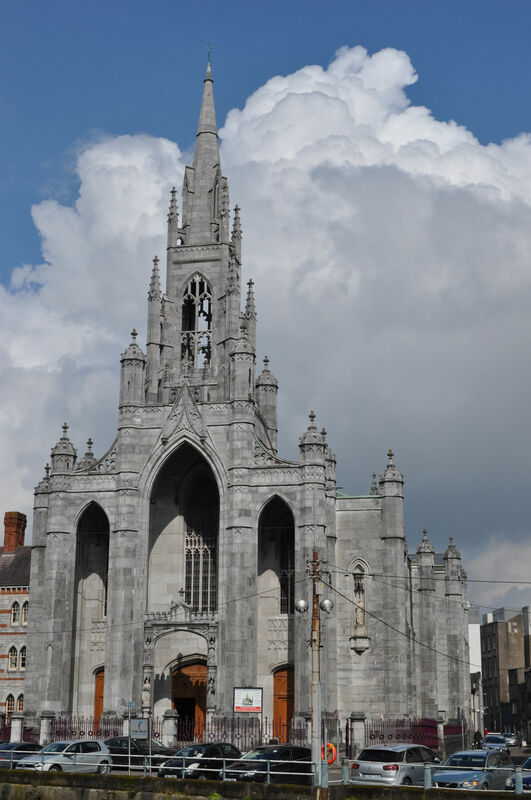 We were later to find out that Cork is built upon several rivers, and some run in tunnels under the streets. 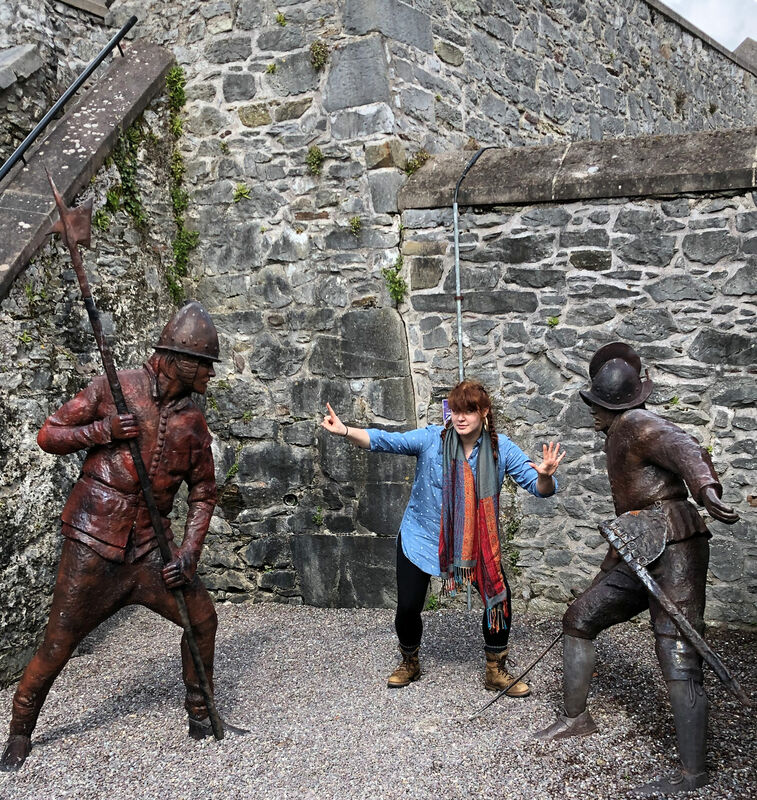 We went first to Elizabeth Fort, in the oldest part of the city, on Barracks Street. The current fort was completed around 1626 and named after Queen Elizabeth I, of course. 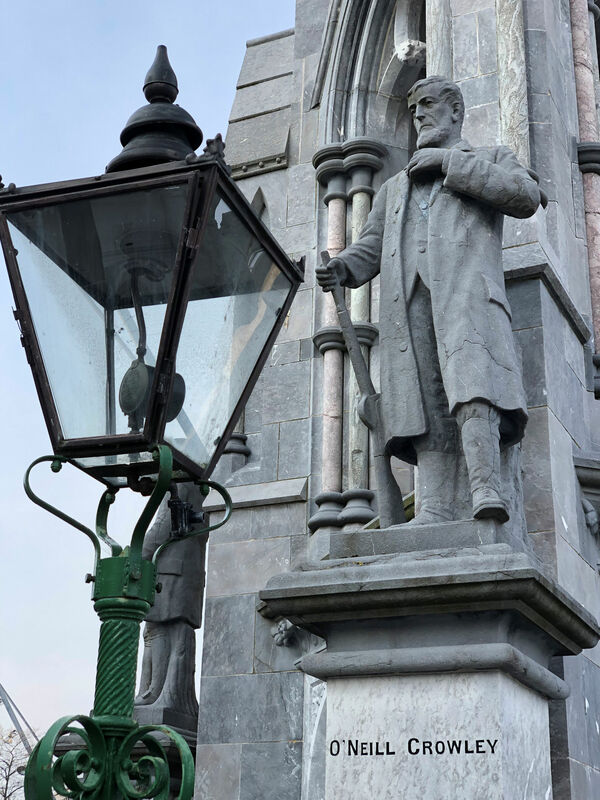 It has played a key role during significant historical events, including Cromwell’s occupation, the famine, the Irish War of Independence and the Irish Civil War. 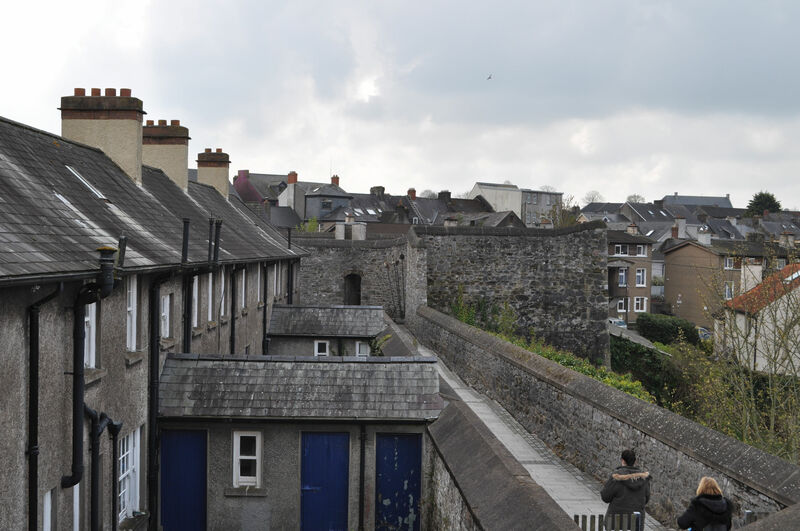 We were in time for the 1pm tour, and got to walk the ramparts of a fort and look out over the city of Cork. It was a great first stop. Our tour guide, Steven, not only told us about the different key moments in the history of the fort, but also had us look out across the city while pointed out the landmarks to note the boundaries of the original city. He explained that the old city wall is now gone, and only a tiny piece remains, which is in one of the city parks. 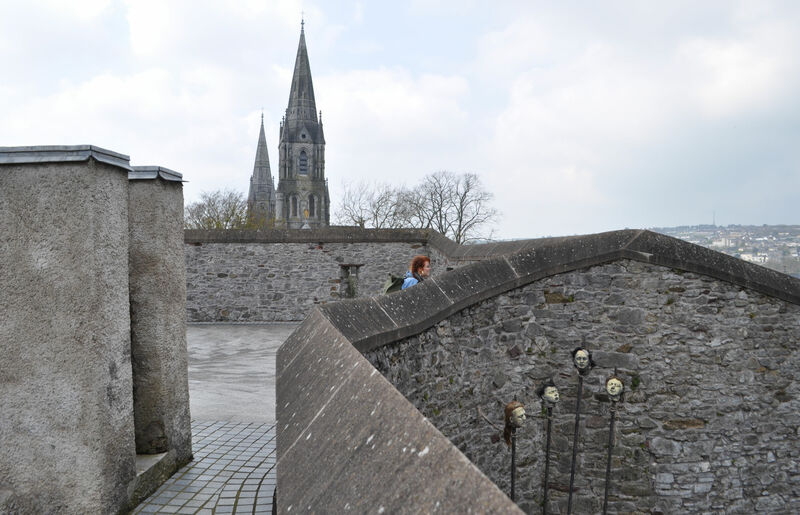 Walking the ramparts of the “star-shaped” fort with the city of Cork surrounding it. 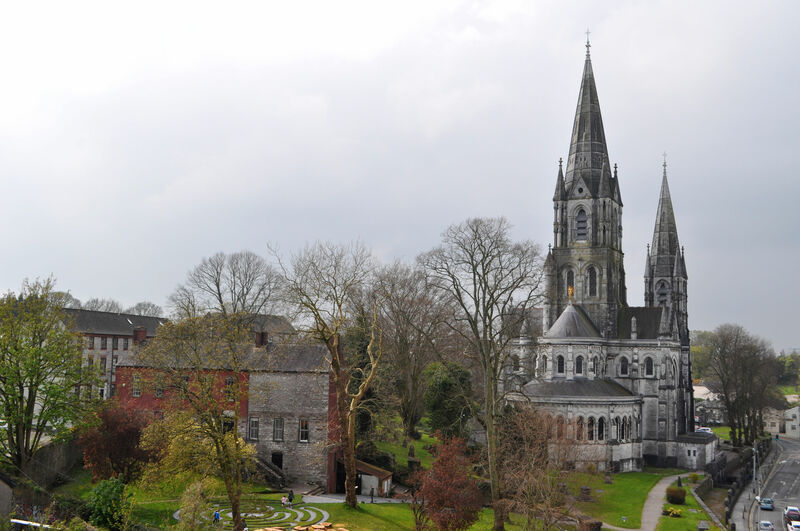 View of St. Fin Barre’s Cathedral from the fort. Tara was really engaging with the exhibits on display in the Fort. Tara peers over the edge at a view of heads on pikes. From the fort we had great views of nearby St. Finn Barre’s Cathedral. We took our time walking along the perimeter inside, peeking into gardens and admiring the neighborhood now grown up around the fort. 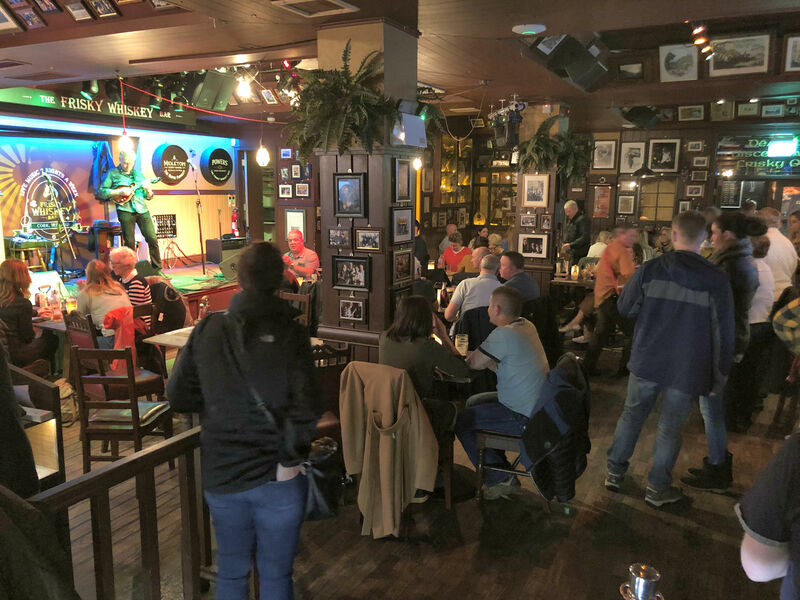 When the tour was over, we chatted with Steven a bit more and he told us about the oldest pub in Cork, and one of the oldest in Ireland. He also told us about a place to get whiskey. Tara wanted to circle the fort, so we made our way out and around and found some fun graffiti along the way. 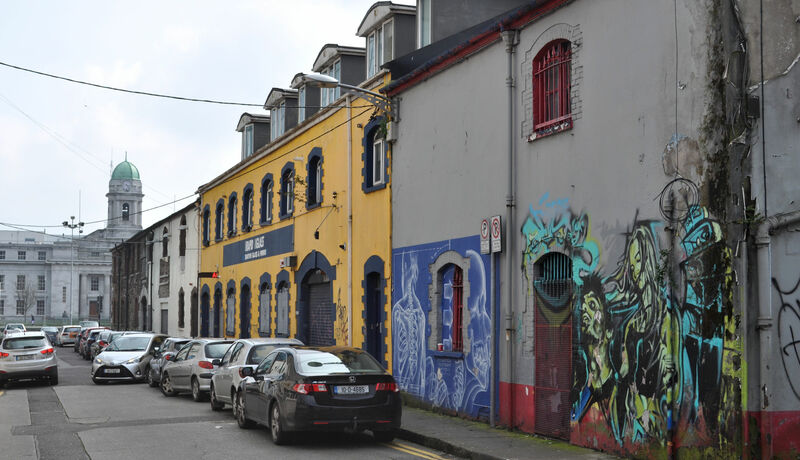 We had been noticing a ton of graffiti in Cork, and between the two of us collected a ton of photos. I think I’m going to do a blog post of only Cork street art. 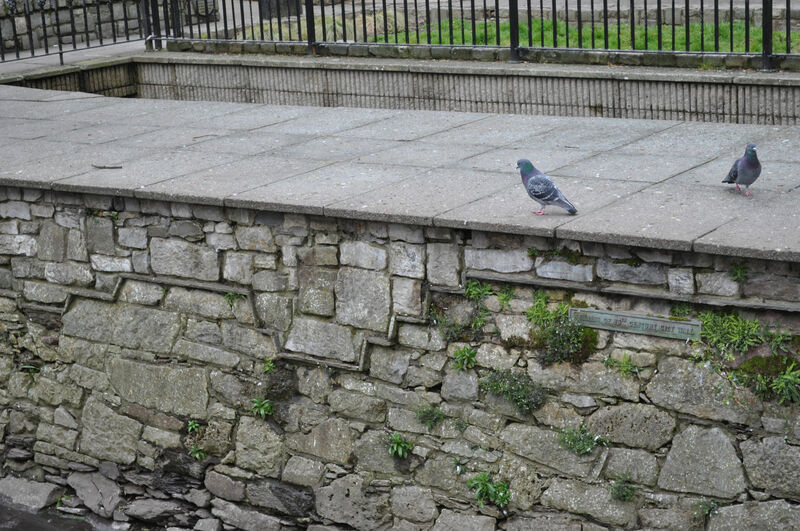 We walked into what was the original Cork city, then we found the park with the wall, and went to see it. Elizabeth Market was across the street from there, so we next went to the big market. I bought snap peas and Tara bought a pomegranate, and we finally headed back to the hotel in hopes that they would now have a room for us to check into. 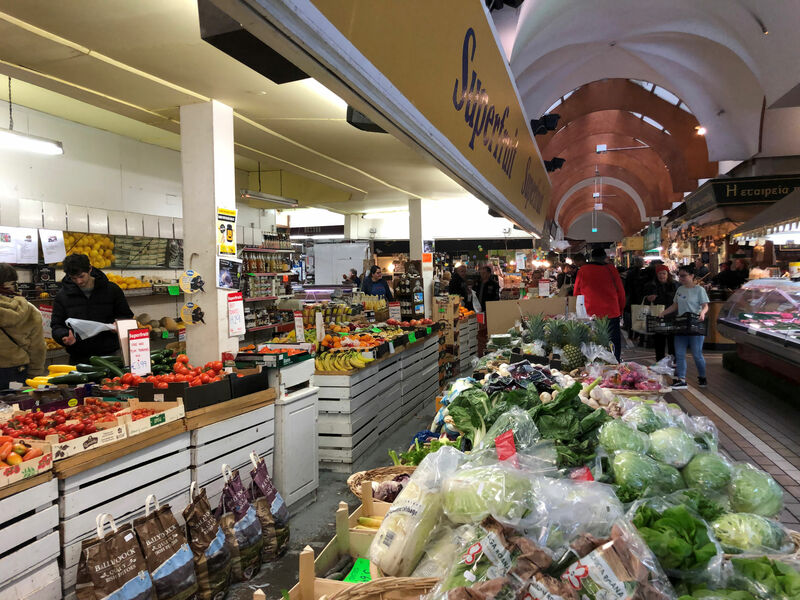 Elizabeth Market in Cork. Named after…uhhh… guess who. After checking in to the hotel, we headed directly back the way we had come, since the city along the river is so inviting. 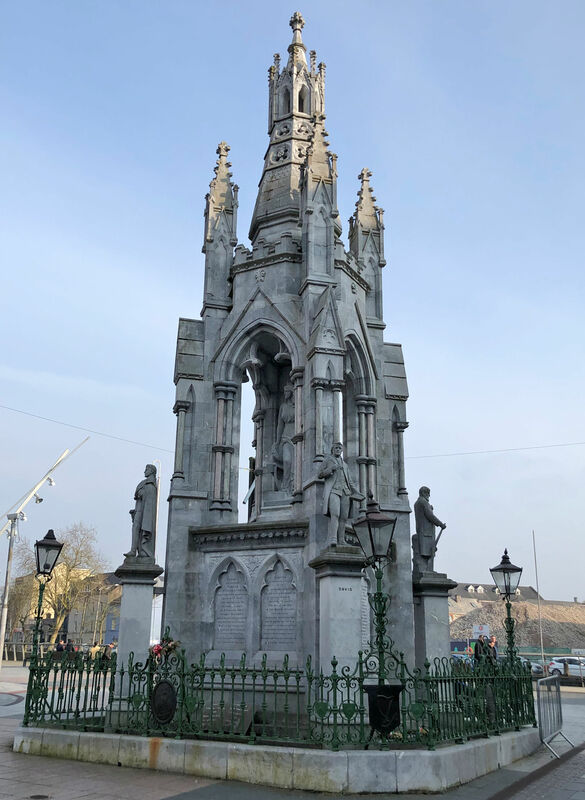 We stopped at a National Monument from 1906 with an inscription on it that says: “To perpetuate the memory of the gallant men of 1798, 1803, ’48, and ’67, who fought and died in the Wars Of Ireland to recover her sovereign independence and to inspire the youth of our country to follow in their patriotic footsteps and imitate their heroic example and righteous men will make our land A NATION ONCE AGAIN.” Prior to the trip I had been studying the key points of Irish history. I had noted a couple of battles and events that seemed relevant – all being the same to me. But arriving here, I find this history is still alive. 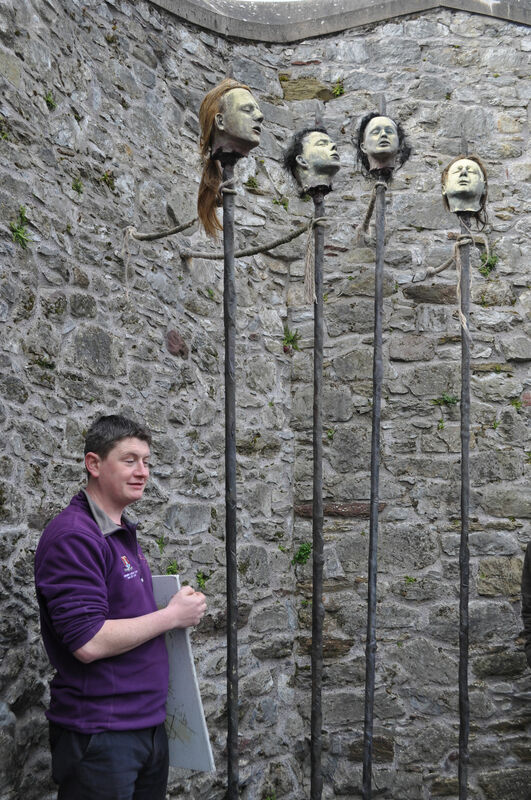 Every single tour guide tells the stories, and every common person at some point refers to England, and Cromwell, and Bloody Sunday if you talk to them long enough. Every monument you look at tells the stories once again. In the Cahir Castle (we went there several days later) there was a whole room dedicated to biographies of the 14 men who were killed after the 1916 Easter Uprising. I have a much better sense of the feelings behind the ache for Irish independence and the complications that have prevented it. 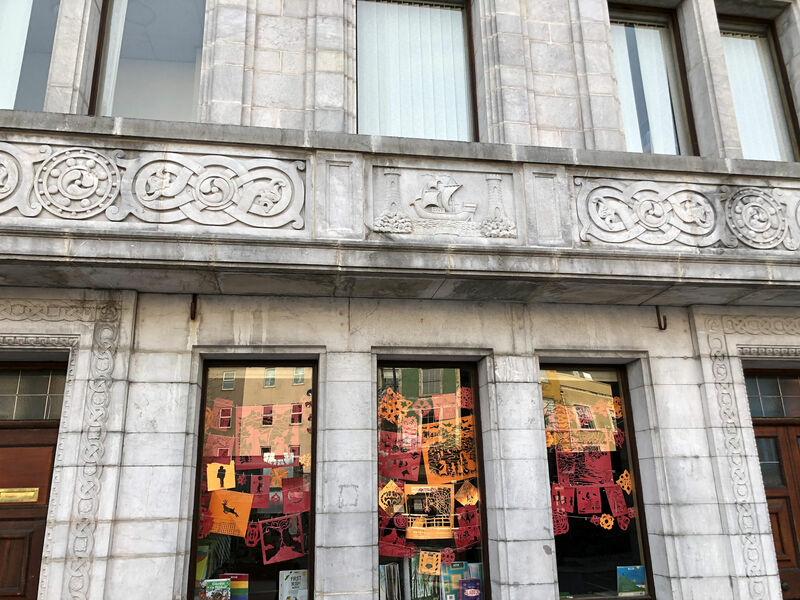 Library in Cork has this engraving of the city seal, which shows a ship sailing into the city between two towers. This suggests a history of a city straddling a river, as we learned from our tour guide. 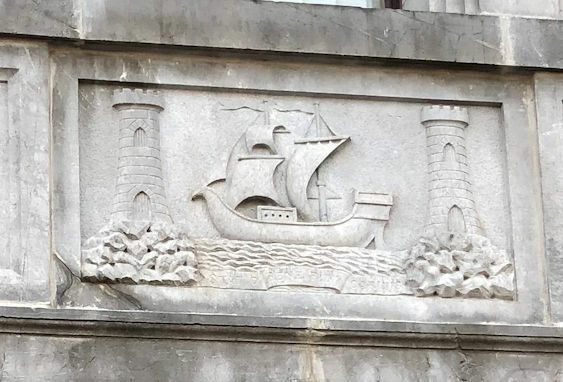 Close up of the stonework showing the imagery of the Cork city seal. 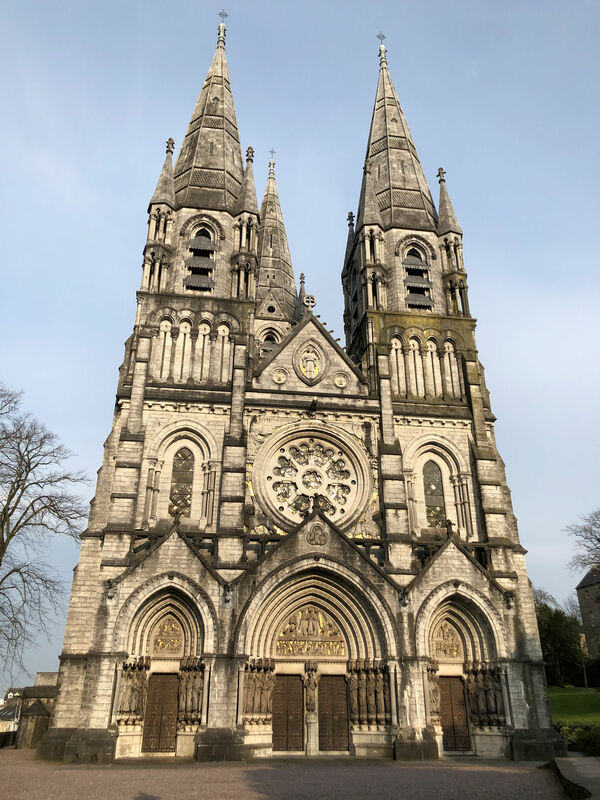 We headed for St. Finn Barre’s Cathedral, completed in 1879. However, it was too late in the day to admit the public, and the gates were locked. 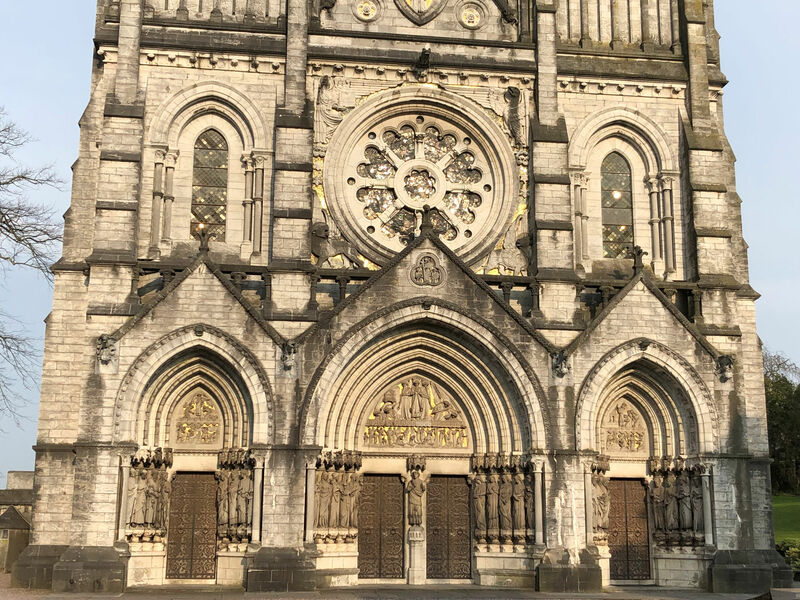 So we circled the enormous gorgeous cathedral, glittering in the setting sun, and took sunset photos through the gates. 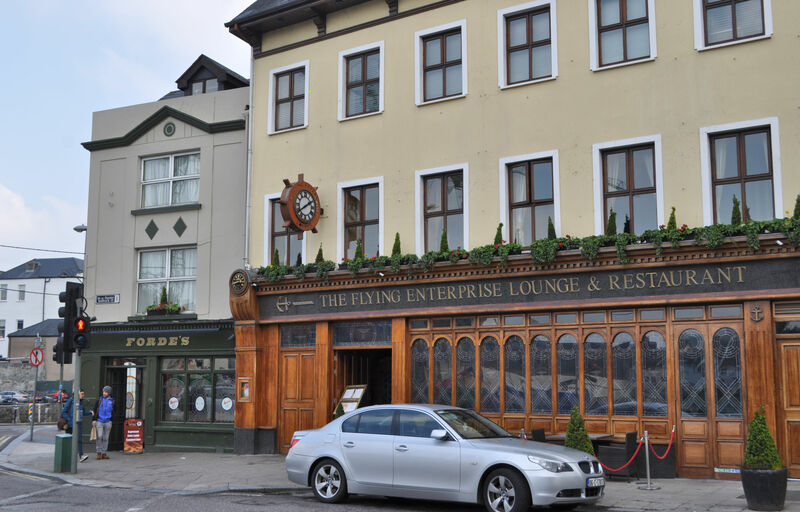 Then we tried to find the oldest pub in Cork but were never sure which one it was so we settled on Forde’s Bar. A man there chatted us up and told us he had lived in Massachusetts for 20 years, which was fun because we also have lived in Massachusetts. The man left, but when I paid our bill, I paid for a couple of pints for that gentlemen whenever he returned. 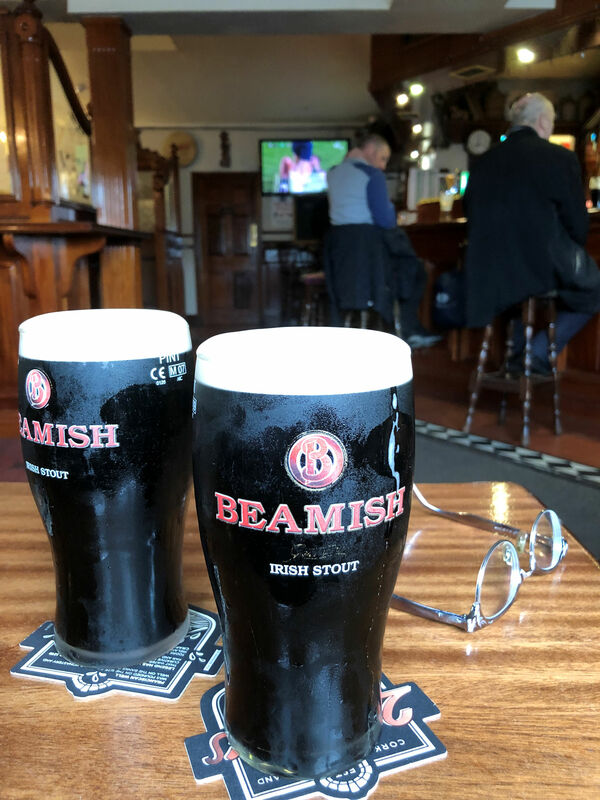 We had a Beamish stout, which apparently is what you drink when you’re in Cork, rather than Guinness. 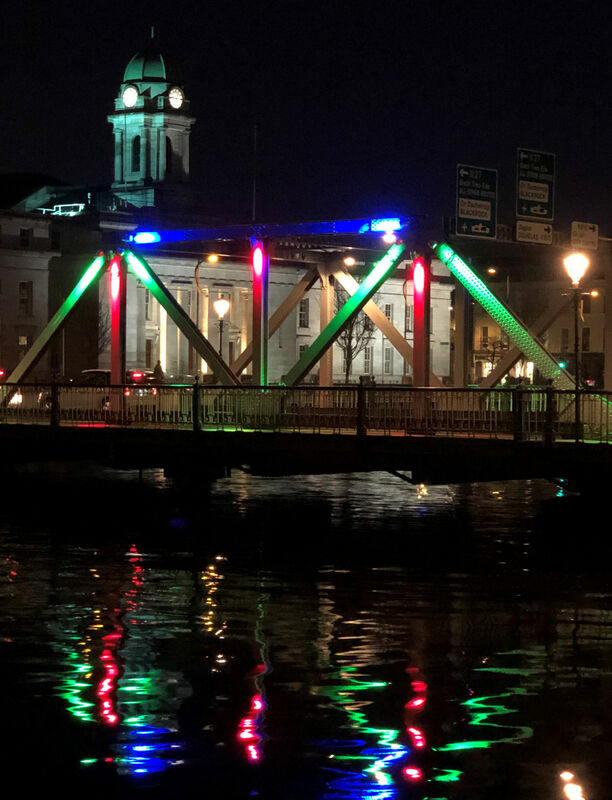 We had only been in Cork a few hours, but already we had detected a sharp criticism of Dublin. Rejection of Guinness was part of that criticism. More graffiti echoed the sentiment. St. Fin Barre’s Cathedral sparkles in the setting sun. 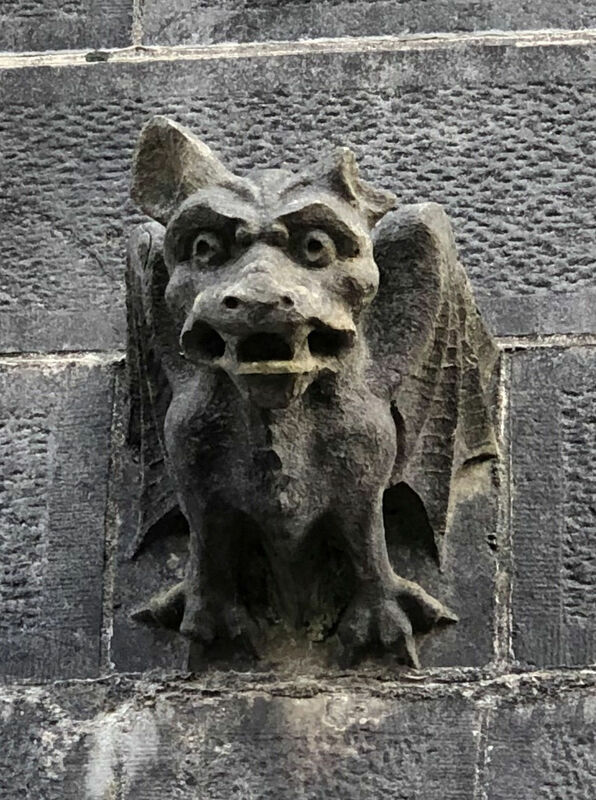 Close up of Cathedral entryway. Forde’s (in the corner, to the left) is a very old, and very comfortable bar. 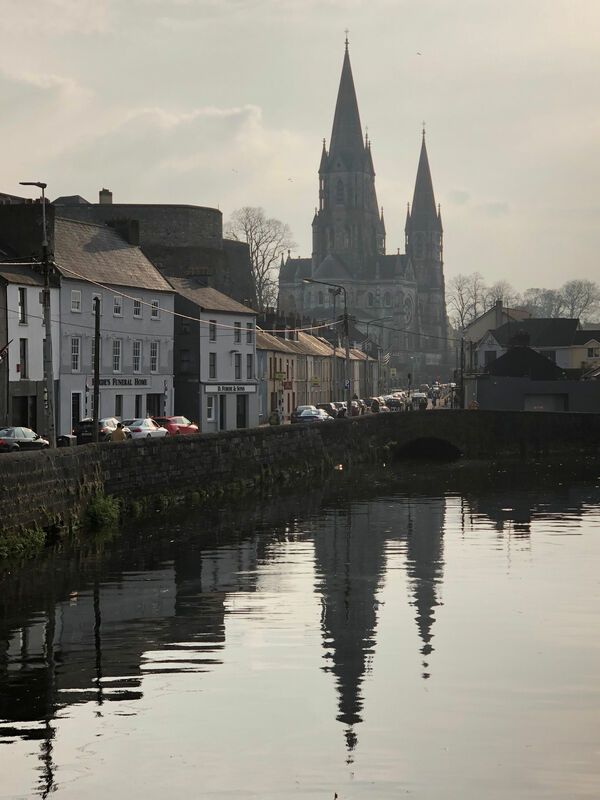 St. Fin Barre’s reflects off the river. Look closely and you can see a tunnel where one of the underground rivers flows beneath the city of Cork. I don’t know who the musicians were, but they were entertaining. 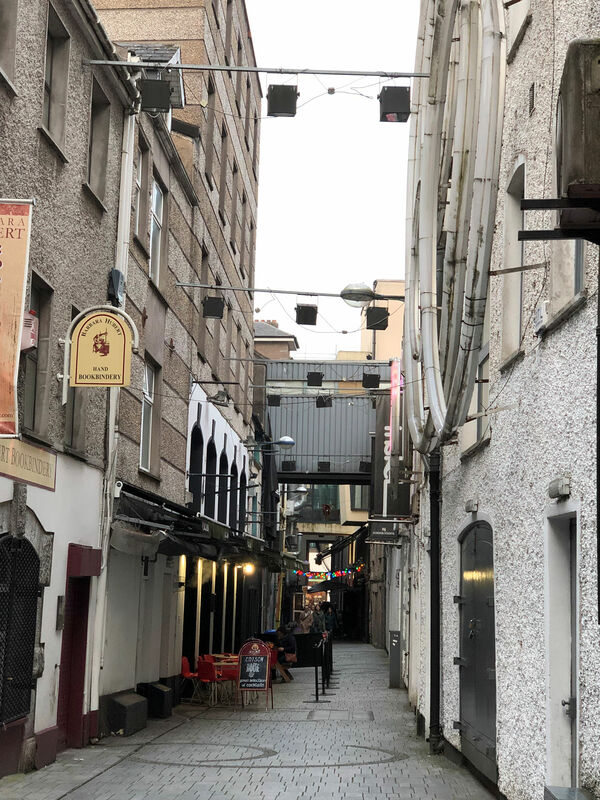 We walked once more down Oliver Plunkett Street and found ourselves in front of Frisky Whiskey, that Steven had mentioned. So we went on up to the second floor where there was live music. 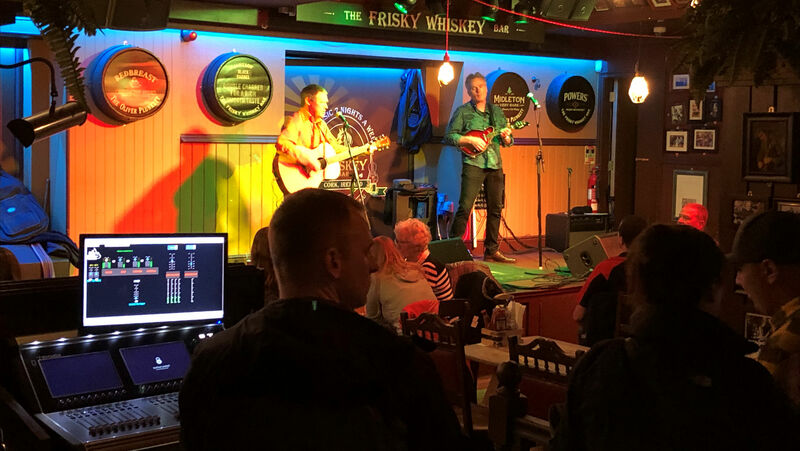 We drank Teeling, a new Irish whiskey we had just heard of, and enjoyed the music till we were tired enough to sleep.